Did you resolve to eat less and exercise more earlier this month? If you’re like most people, you did so again this year with the best of intentions. And if your motivation is still strong by this point in the month, you may be on well on your way to establishing a new habit. But for many, once the novelty wears off and the hard work of daily discipline sets in, the relapse into familiar routines is inevitable. As a certified eating psychology coach, I know how difficult it is to make changes that have been a part of your personal narrative for decades. So instead of setting yourself up for a losing battle, why not set yourself up for support? What makes you feel alive, supported, understood, loved, happy, and free? It’s not just what you put in your mouth but also what you put in your mind that determines your health. It’s not just how you move your body but what moves your soul that determines your well-being. The answers to these questions are the ones that interest me because they tell me what really matters to you and how motivated you may be to make a change. When you can honor all of who you are and consider your mind, body, emotions, and spirit when you resolve to evolve, you have a much better chance of manifesting what matters to you. This year ask yourself what nourishes you. And then give yourself the gift of providing it on a regular basis. And if you’d like some help with that, you’re in luck! For the first time in many moons, I have a few private coaching slots open. If you are interested in transforming the ordinary into the extraordinary and living your best life, let’s talk. Leave a comment below with the words “Coach Me!” and we’ll set up a clarity call. This might just be the most outrageous challenge I’ve put together to date. I am not a holiday person. I do not go gleefully into the “holi-daze”. The most wonderful time of the year is when all the hullabaloo is behind me. Not when I’m facing six weeks of seasonal stress disorder starting with Black Friday. A year of surprises on several fronts have left me with the belief that anything is possible. With that in mind, I will attempt to abandon my inner Grinch and walk fearlessly toward the New Year in Good Cheer. But it will take a village. 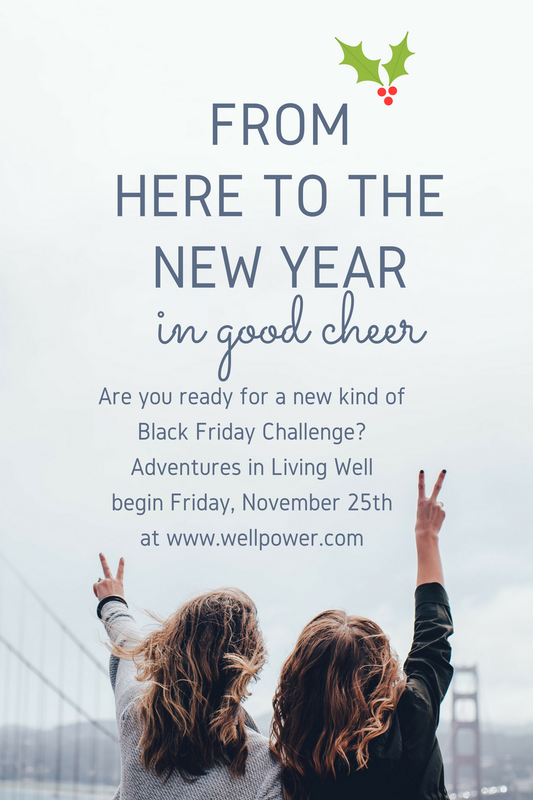 So if you are up to the challenge, I invite you to join me for some adventures in living well. Instead of postponing all resolutions until the New Year at the first sign of subtle or not-so-subtle sabotage, I say we start stringing together several small successes from here to the end of the year. This way we have the habits in place that we’ll need to reach the reasonably radical resolutions that will redefine our reality in the New Year. Starting on Friday, November 25th, I’ll email you a quick tip, subtle suggestion, perspective changing practice, or mindful moment that you can easily implement into your day to keep you humming through the holidays. Since Plan A and even Plan B are seldom fail proof, I’m implementing a whole alphabet plan. Starting with A and working our way through Z, each letter will get its day and have the opportunity to be the inspiration for the action of the day. So, my surly Scrooges and grumpy Grinches, shall we give this thing a try? If you are in, please click here to join the fun. Once registered, you’ll receive a confirmation email with a free Holiday Survival Guide you can download and refer to throughout the holiday season. Thanksgiving is my favorite Thursday of the year because it’s all about grace, gratitude, delicious food, and compelling conversations. I am so grateful to you for allowing me into your reading space and letting me share the ideas that refuse to let go of me until they find their way to you. This Thanksgiving, keep calm and gobble on, my friends. And by all means, join me in the Here to The New Year in Good Cheer challenge. Signing up gives you access to bonuses and other surprises not available by just reading the blog.